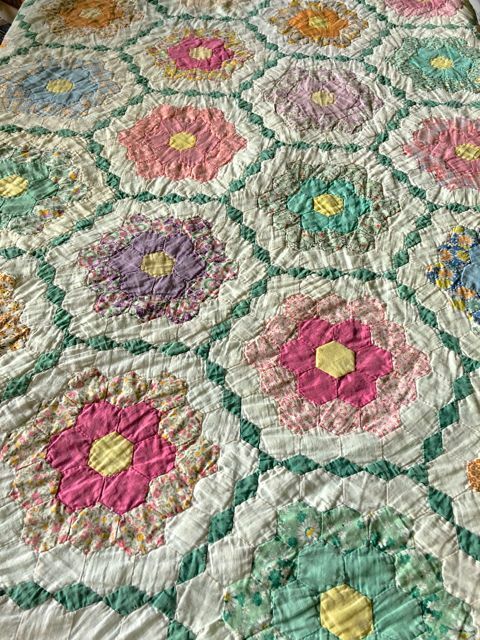 Quite honestly, Grandmother's Flower Garden is not one of my favorite patterns. And I do get quite a few of them coming in for repair, so I spend quite a bit of time looking at them. If I ever make one, which is not at all likely, it'd be like this one. 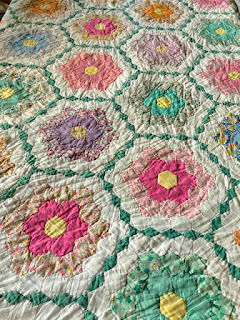 I like the addition of the tiny diamond paths between the flowers. 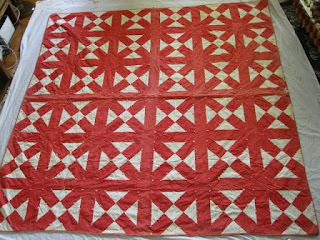 These hexies are about 7/8" inch on a side, and the piecing and quilting are quite nicely done. 24 Out of 48 -- We're Halfway There! Hello, my lovelies, and Happy Wednesday! I've been "distracted" by work and a series of minor but mildly disabling medical maintenance over the past week or so, but I was finally able to get back to my projects a few days ago and have some progress to report. 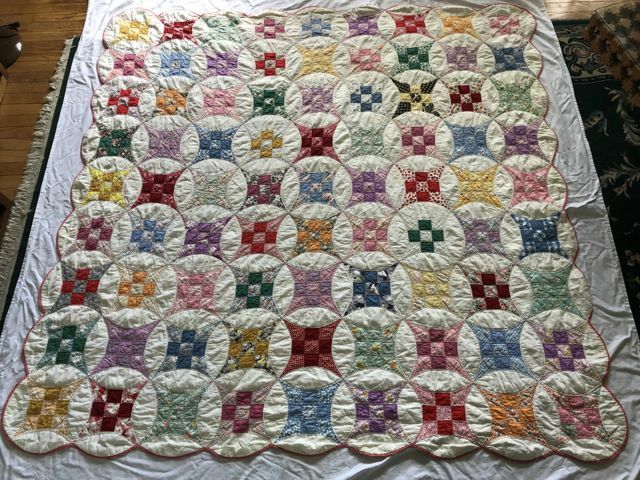 I really enjoyed working on this quilt. 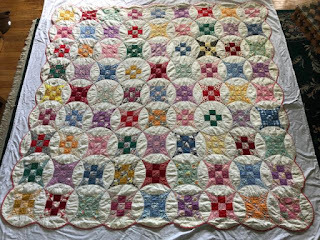 It's a kind of quilt that I have dubbed a "quilt-y quilt" - meaning it personifies what lots of folks think an old quilt ought to look like. 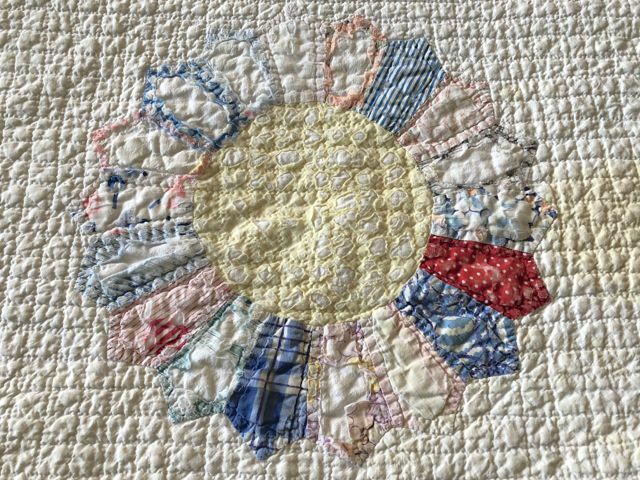 A traditional pattern, scrappy, cozy and bright. 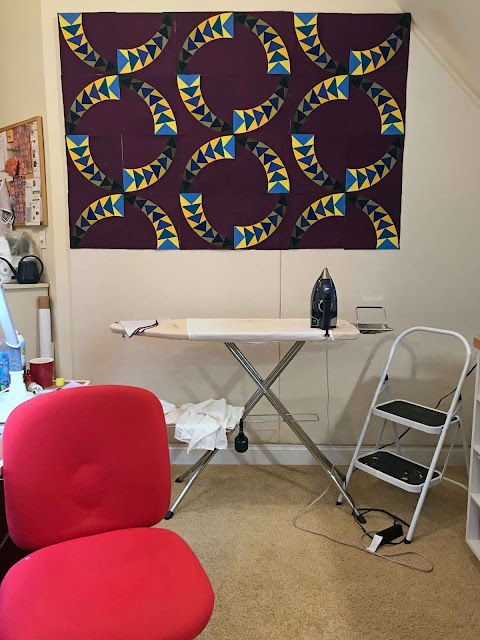 The pattern is called Improved 9-Patch, and with all the curves and narrow points, probably not a beginner's quilt. 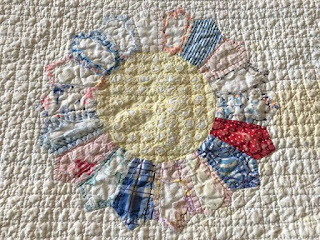 The stitching, both the piecing and the quilting, is very well done. 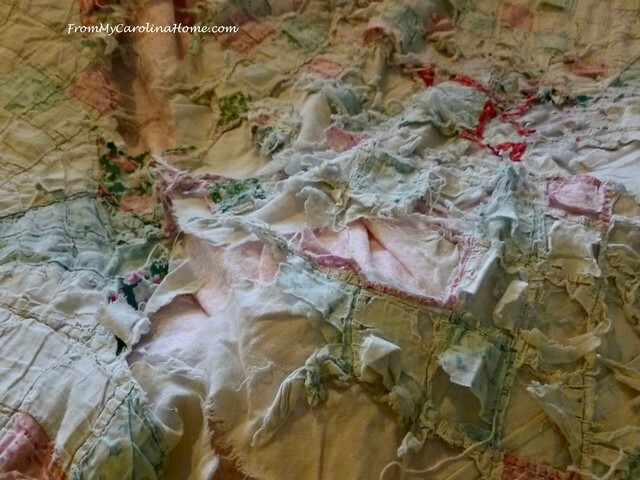 Last year, I repaired a Severely Damaged Quilt, showing the steps of that repair on the blog. 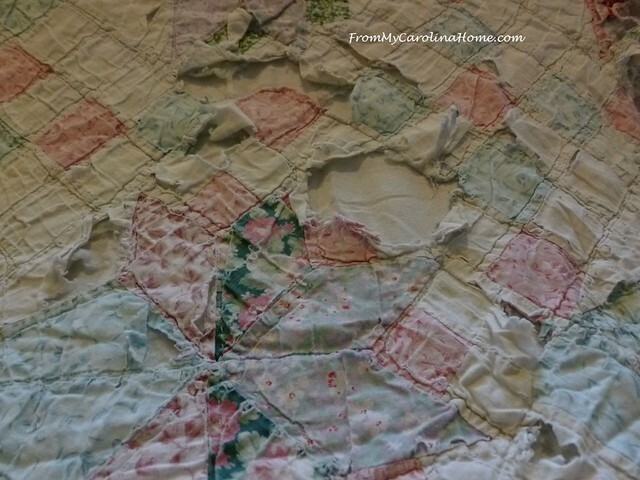 I thought that would be the most damaged quilt I would ever see, but I was wrong. 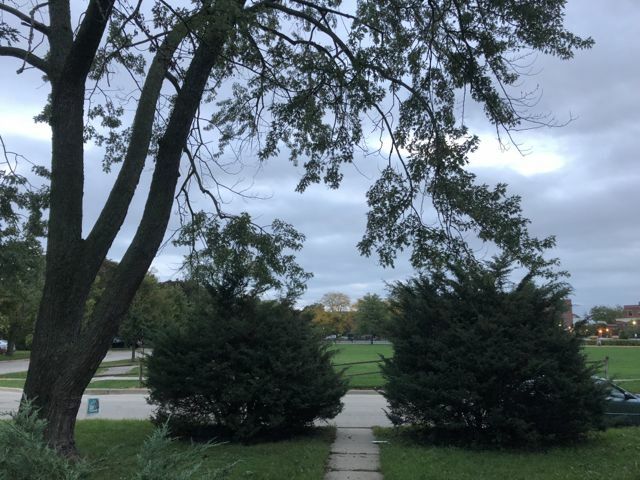 Get ready for a very picture heavy post!! This one was my biggest challenge yet! 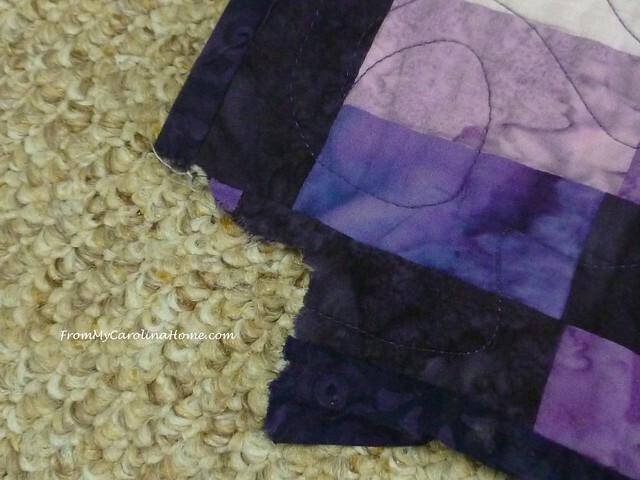 Large holes were in several places that went all the way through the quilt. 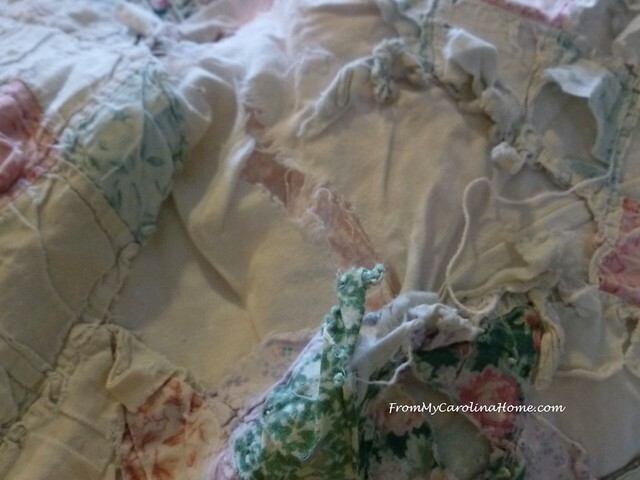 The pink you see underneath the white fabric is actually the new fabric that will become a new backing. In places the backing was intact, but the top was just shredded and the batting was gone. 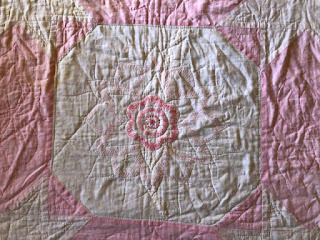 This quilt belongs to a friend of mine from church choir. 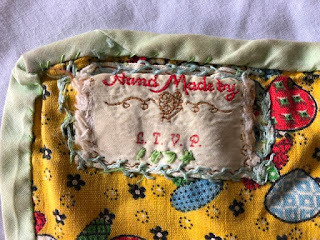 It was made by her grandmother, she has had it since before she was married, and it holds a lot of special memories. She brought it to me for advice on how she could repair it herself, but I offered to do it for instead. 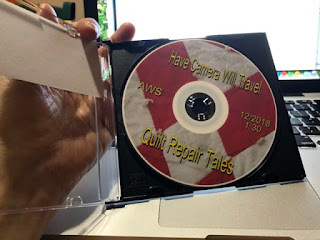 I knew this was going to be a can of worms and I didn't want to tell someone who is not a quilter how to take apart a treasured quilt that she might not be able to get back together again. Now that all the excitement and preparations around the exhibit have come and gone, I'm publishing the compilations of statistics and stories I discovered about life in Melrose, MA, at the end of the 19th century. A previous post describes the exhibit and events. Links to many chapters chronicling the research process can be found below. I hope you enjoy the saga as much as I enjoyed it! 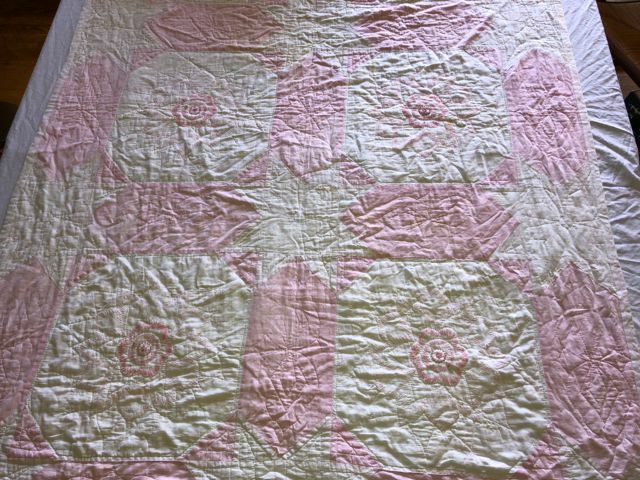 Here are two heirloom quilts that came to me in need of some TLC. 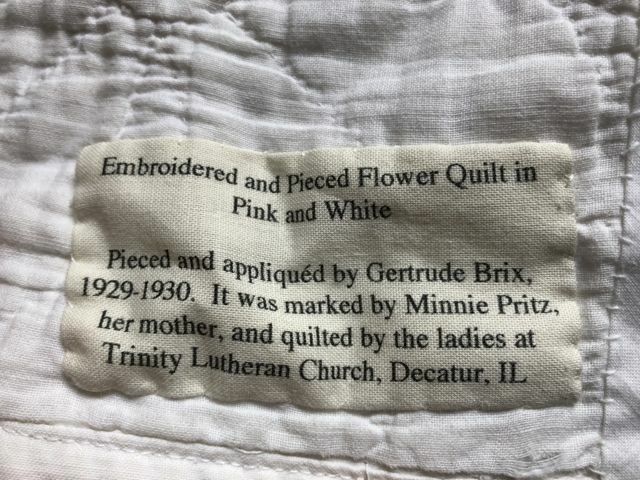 At some point, someone affixed typed labels that identify the quiltmakers and the quilts' histories. This is what's called "provenance" in the antiques biz, and is always a good thing! 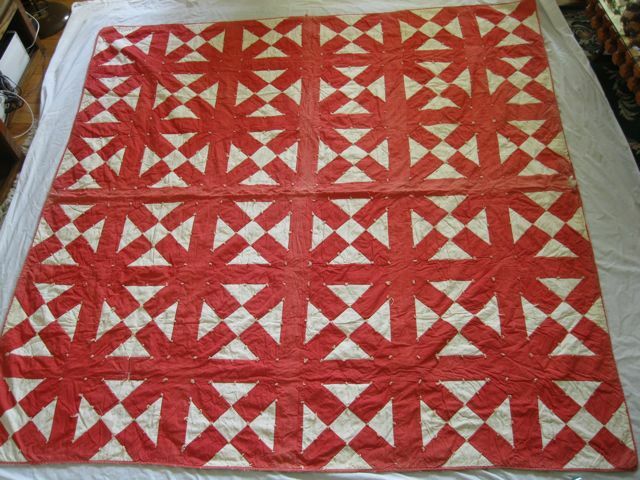 This is a six-block quilt, with relatively large blocks and wide sashing. 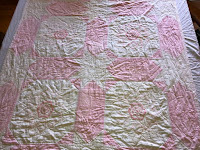 The sashing is made of pink lozenges with white triangles and white cornerstones which together create stars. There's a nice interplay between the large stars and the delicate embroidery. Don’t you just love dogs? They are bundles of furry love with doggie breath, and sometimes they like to chew on things. 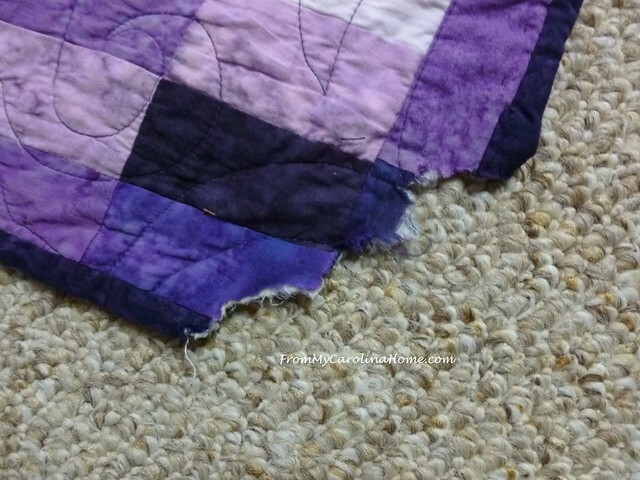 Recently, I was contacted to repair a well-loved quilt that had seen its share of doggy attention. Two of the corners were chewed off completely. This one was on one end. This was the opposite corner. Happy New Year! Hopefully 2019 is a year of recovery and peace worldwide; a time for us to embrace the best of our beliefs in common humanity and kindness. While on my trip to Massachusetts and New Hampshire, my lecture "Quilt Repair Tales" was filmed for the Melrose, MA, local access cable. Yep. So now, I'm on TV. (Right now, it's listed as a Current Video. Eventually, I suspect it'll just show up on the Videos tab. As if being on TV wasn't cool enough! I got interviewed on a podcast!!! Since my previous post, the events I described then have come to pass. A 3 1/2 year project had its milestone event. 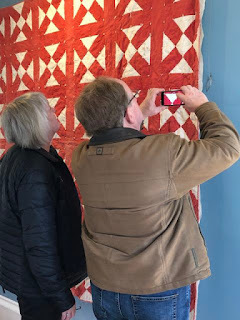 I’m not going to say that the project reached its conclusion, because I really want the research and storytelling around this quilt to continue. There are plenty of loose ends left to be tied! In that previous post, you can read the process leading up to this exhibit. And at the end of that post, there are links to other posts that I wrote along the way during that 3 1/2 years. 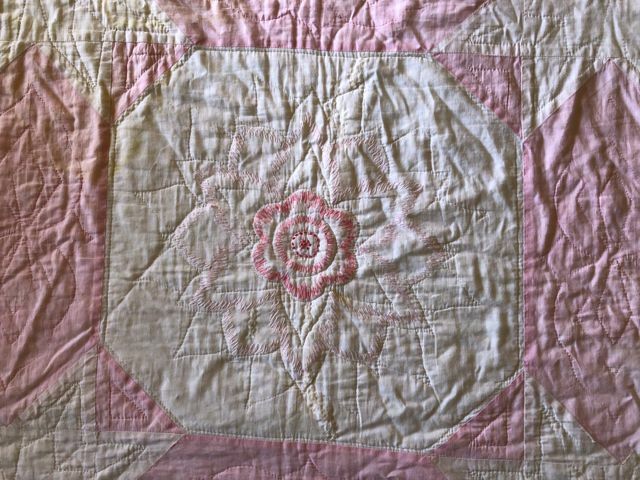 The owner's great-grandmother made this quilt in 1974 for his mother. It was made from the fabrics of dresses from his mother's childhood. The dresses were originally handmade by his grandmother and great-grandmother, and then repurposed for the quilt. So it is indeed a special memory quilt! Here is the dated label. 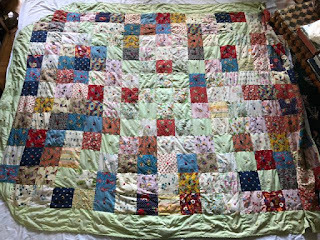 This type of quilt is known as a potholder quilt. 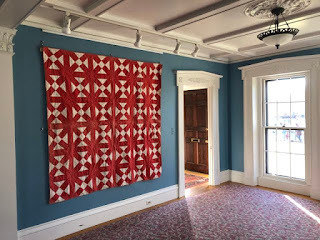 It is constructed from rectangles of fabric that were folded in half, stuffed, and yarn tied. 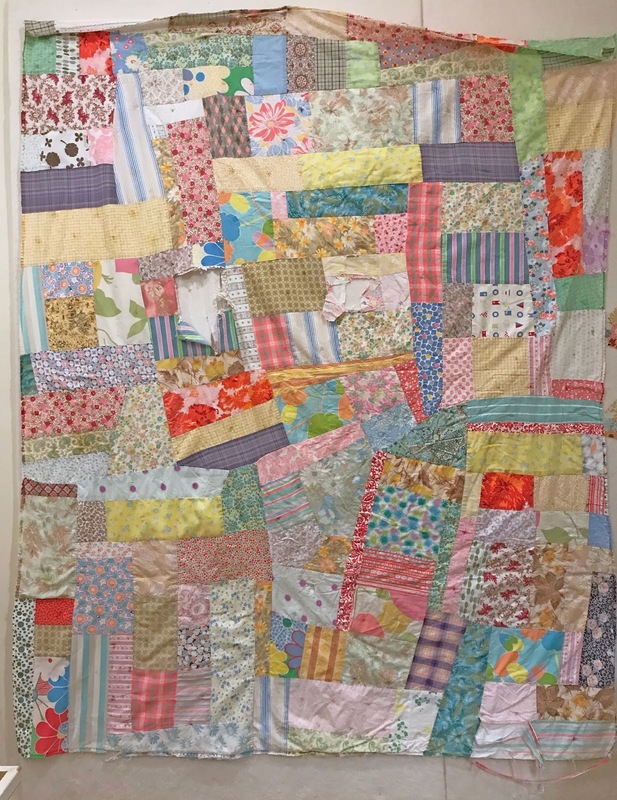 Then the squares were whipstitched together into the quilt itself. 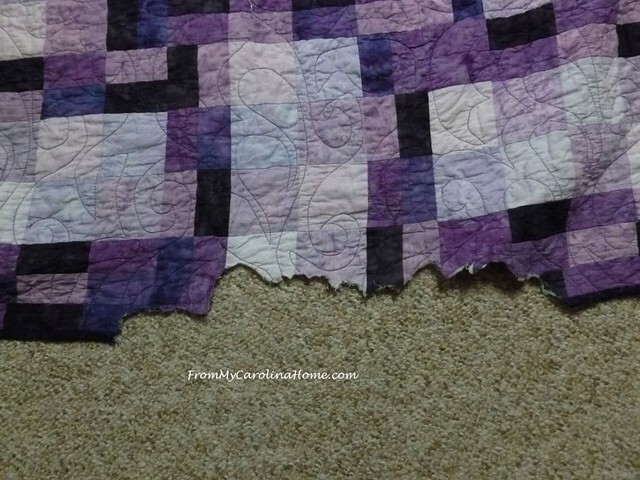 It makes a reversible quilt, both sides identical. So, here's how I had fun on a cool, grey, damp Saturday afternoon. 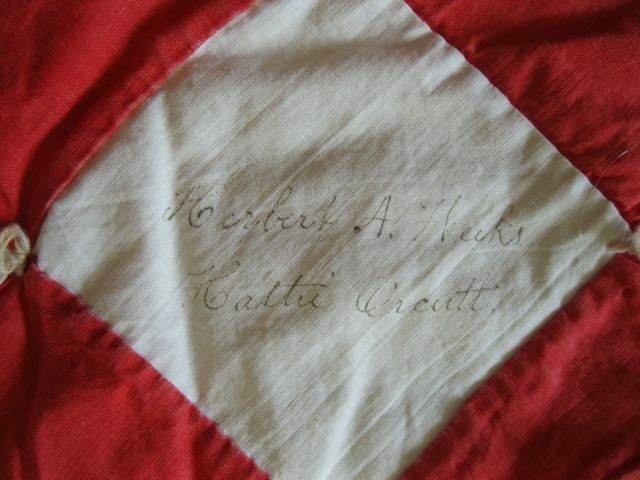 I’m taking the next step in the research into the names on a quilt that was most likely made in Melrose MA, in the late 1890s. 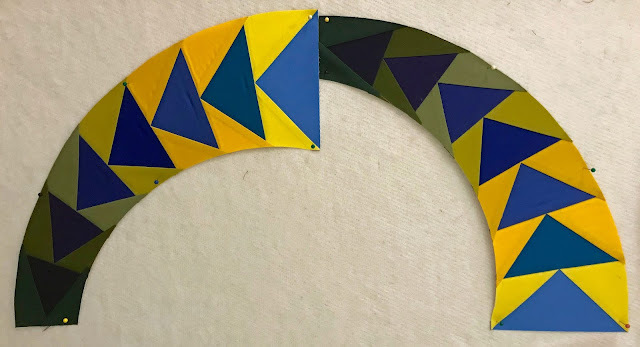 The story of all the previous work is on this blog, starting with Part 1 and linking along for several more posts. This quilt has been on a magical journey of rediscovery.